We already have more than twenty-five years of academic research on migration and torture; the field has developed into an increasingly complex one since the first descriptive and epidemiological studies. This Editorial puts forward a conceptual map for helping to understand migration and torture and introduces the collection of papers in this issue of the Torture Journal. Allsopp, J., Sigona, N., & Phillimore, J. (2014). Poverty among refugees and asylum seekers in the UK An evidence and policy review. IRiS Working Paper Series, 1–46. Alpes, J., Blondel, C., Preiss, N., & Monras, M. S. (2017). Post-deportation risks for failed asylum seekers. Forced Migration Review, 54, 76-78. Brooker, S., Albert, S., Young, P., Steel, Z., Flynn, M., & Flynn, M. (2016). Challenges to Providing Mental Health Care in Immigration Detention About the Global Detention Project Challenges to Providing Mental Health Care in Immigration Detention, (19). Crisp, J. (2009). Refugees, persons of concern, and people on the move: The broadening boundaries of UNHCR. Refuge, 26(1), 73–76. Daniel, E. V., & Knudsen, J. C. (1995). Mistrusting refugees. Berkeley: University of California Press. EATIP, GTNM/RJ, CINTRAS, & SERSOC. (2002). Paisajes del Dolor, Senderos de esperanza. Salud mental y derechos humanos en el Cono Sur. European Council. (2013). L 180/60. Common procedures for granting and withdrawing international protection. Freedom for Torture. (2012). Sri Lankan Tamils tortured on return from the UK. Freedom for Torture. (2016). Proving Torture. Demanding the impossible. Home Office mistreatment of expert medical evidence. London. Griffiths, M. (2012). Vile liars and truth distorters. Anthropology Today, 28(5). Gyulai, G., Kagan, M., Herlihy, J., Turner, S., & Lilli, H. (2013). Credibility assessment in asylum procedures. A Multidisciplinary Training Manual (Vol. 1). Hungarian Helsinki Committee. Haoussou, K. (2017). Perspective—The long journey to rehabilitation for torture survivors i. Torture, 27(1), 66–74. Home Office. (2015). Asylum Policy Instruction: Assessing Credibility and Refugee Status. Hope Border Institute. (2018). Sealing the border. The criminalization of asylum seekers in the Trump era. El Paso. HRW. (2012). UK: Halt Deportations of Tamils to Sri Lanka. IRCT. (2016). Falling Through the Cracks: Asylum procedures and reception conditions for torture victims in the European Union. Copenhahue: IRCT. Jesuit Refugee Service - Europe. (2010). Becoming vulnerable in detention - Civil Society Report on the Detention of Vulnerable Asylum Seekers and Irregular Migrants in the European Union (DEVAS). Johnson, H., & Thompson, A. (2008). The development and maintenance of post-traumatic stress disorder (PTSD) in civilian adult survivors of war trauma and torture: a review. Clinical Psychology Review, 28, 36–47. https://doi. org/10.1016/j.cpr.2007.01.017 Johnston, V., Allotey, P., Mulholland, K., & Markovic, M. (2009). Measuring the health impact of human rights violations related to Australian asylum policies and practices: A mixed methods study. BMC International Health and Human Rights, 9 (1). Kane, J. (2008). Judging Credibility. New York: American Bar Association. Khosravi, S. (2018). After deportation. Ethographic perspectives. Palgrave McMillan. Mackey, A., & Barnes, J. (2013). Assessment of Credibility in Refugee and Subsidiary Protection claims under the EU Qualification Directive Judicial criteria and standards Prepared by Allan Mackey and John Barnes for the International Association of Refugee. Mewes, R., Friele, B., & Bloemen, E. (2018). Validation of the Protect Questionnaire: A Tool to Detect Mental Health Problems in Asylum Seekers by Non-Health Professionals. Torture, This issue. Mind. (2010). Achieving justice for victims and witnesses with mental distress. A mental health toolkit for prosecutors and advocates. London: Mind-For better health. Montgomery, E. (2011). Trauma, Exile and Mental Health in Young Refugees. Acta Psychiatrica Scandinavica, 124(September). Onyoin, C. A. (2017). A grim return : postdeportation risks in Uganda. Forced Migration Review, (February), 81–83. Pearman, A., Psych, B., Olinga-shannon, S., & Hons, B. B. A. (2017). Australian immigration detention and the silencing of practitioners, 90–93. Pérez-Sales, P. (2017a). Psychological Torture: definition, evaluation and measurement. London- New York: Routledge. Pérez-Sales, P. (2017b). Psychotherapy for torture survivors—Suggested pathways for research. 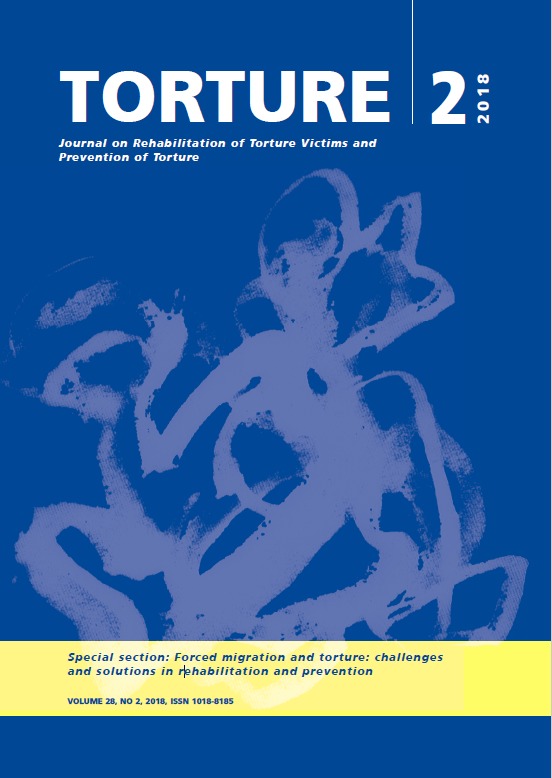 Torture : Quarterly Journal on Rehabilitation of Torture Victims and Prevention of Torture, 27(1), 1–12. Pérez-sales, P., Witcombe, N., & Otero Oyague, D. (2017). Rehabilitation of torture survivors and prevention of torture: Priorities for research through a modified Delphi Study. Torture, 27(3), 3–48. Pettitt, J. (2013). The Poverty Barrier: The Right to Rehabilitation for Survivors of Torture in the UK, (July). PROTECT Project. (2016). PROTECT. Process of Recognition and Orientation of Torture Victims in European Countries to Facilitate Care and Treatment. Brussels. Ramos, C. (2011). Unsafe Return: Refoulement of Congolese Asylum Seekers. Robinson, V., & Segrott, J. (2002). Understanding the decision-making of asylum seekers. Home Office Research Study, (243), 84. Roman, E., Baird, T., & Radcliffe, T. (2016). Why Turkey is Not a “Safe Country.” Statewatch Analysis, 2013(February), 1–26. Rosenthal, E. (2018). The right of people with disabilities to asylum and protection from deportation on the grounds of Persecution or Torture Related to their disability. Silove, D. (2013). The ADAPT model: a conceptual framework for mental health and psychosocial programming in post conflict settings. Intervention, 11(3), 237–248. Sobhanian, F., Boyle, G. J., & Bahr, M. (2006). Living in the Australian Community Psychological Status of Former Refugee Detainees From the Woomera Detention Centre Now Living in the Australian Community. Psychiatry, Psychology and Law, 13(2), 37–41. Stedman, S. J., & Tanner, F. (2003). Refugee manipulation. War, politics and the abuse of human suffering. Washington: Brookings Institution Press. Steel, Z., & Silove, D. M. (2001). The mental health implications of detaining asylum seekers. Medical Journal of Australia, 175, 596–599. Stefanovska, V. (2016). Diplomatic Assurances and the State ’ s Responsibility When Considering Extraditing a Person Whose Human Rights May Be Violated. VARSTVOSLOVJE, Journal of Criminal Justice and Security, (2), 167–182. Storm, T., & Engberg, M. (2013). The impact of immigration detention on the mental health of torture survivors is poorly documented - A systematic review. Danish Medical Journal, 60(11), 1–7. Tirado, M. C. and I. G.-S. (2008). Quality in and Equality of Access to Healthcare Services. Country Report for Romania. Brussells. Ulusoy, O., & Battjes, H. (2017). Situation of Readmitted Migrants and Refugees from Greece to Turkey under the EU-Turkey Statement, (15), 1–42. UNHCR-International Detention Coalition - OAK. (2016). Vulnerability Screening Tool. Identifying and addressing vulnerability: a tool for asylum and migration systems. UNHCR. (2017). UNHCR- Global Trends. Forced displacement in 2016. Geneva. Switzerland. United Nations High Commisioner for Refugees. (2012). Detention guidelines. UNHCR. Viñar, M. (2007). Civilization and torture : beyond the medical and psychiatric approach. International Review of the Red Cross, 89(867), 619–633. Voutira, E., & Harrell-Bond, B. (1995). In search of the locus of trust: the social world of the refugee camp. In E. V. Daniel & J. C. Knudsen (Eds. ), Mistrusting refugees (pp. 207–225). University of California Press. Authors will be asked to sign a transfer of copyright agreement, which recognises the common interest that both journal and author(s) have in the protection of copyright. We accept that some authors (e.g. government employees in some countries) are unable to transfer copyright. The copyright covers both the Torture Journal and the IRCT web site. The publisher will not put any limitation on the personal freedom of the author to use material contained in the paper in other works which may be published, provided that acknowledgement is made to the original place of publication.